Naissance : 24 décembre 1969, à Nevinnomyssk, territoire de Stavropol, Russie. Sélection : 14 octobre 1997, détachemsnet RSC Energia. Total : 159 j. 08 h. 42 min. Temps à bord d'ISS ISS Expédition 25/26 156 j. 22 h. 17 min. Total: 156 j. 22 h. 17 min. Total 16 h. 40 min. DATE AND PLACE OF BIRTH: December 24, 1969, town of Nevinnomyssk, Stavropol Territory, RSFSR (Russia). Father: Ivan Semyonovich Skripochka, born in 1947, military, artilleryman, retired lieutenant-colonel. Mother: Galina Yefimovna Skripochka, born 18.01.1948, Senior assistant to Head of Department, Zaporozhye Military Registration and Enlistment Office. EDUCATION: He attended a number of schools in Zaporozhye and Petropavlovsk-Kamchatski. In 1987 he finished Secondary School ¹28 specializing in physics and mathematics in Zaporozhye. In 1993 he graduated from MVTU after N.E.Bauman, branch department of power machine building, town of Kaliningrad, specializing in the field of Flight Vehicles and acquiring a profession of mechanical engineer. HOBBY: parachute jumping and travelling by cycling. In December 1990 he started working as a technician (since August 1, 1993 - engineer) at NPO Energia's PDB. From June 1996 till his being enlisted in the Cosmonauts Corps he was engaged in the development and operation of ground support equipment for preparation of transport manned and cargo space vehicles and Upper Stages DM. He had passed medical examination in the Institute for Medical and Biological Problems (IMBP) and was found fit to take part in special trainings. On July 28, 1997 at the meeting of the State Interdepartmental Commission (SIDC) he was recommended to be enlisted in RSC Energia's Cosmonauts Corps. On October 14 RSA General Director by his order appointed him a test cosmonaut candidate of RSC Energia's Cosmonauts Corps. From January 16, 1998 till November 26, 1999 he received general space training at RGNII CTC after Yu.A.Gagarin and had successfully passed all tests. On December 1, 1999 the Interdepartmental Qualification Commission by its decision qualified him as a test cosmonaut. On February 9, 2000 he was appointed to the post of test cosmonaut of RSC Energia Cosmonauts Corps. From February 7, 2000 he got training at RGNII CTC as a member of the ISS Program Cosmonauts Team. In early December 2002 RGNII CTC, RSC Energia and IMBP by their joint decision assigned him as Flight Engineer to the second (backup) crew of Russian 6th ISS Visiting Crew (VC-6). However, after Columbia Shuttle catastrophe, the crew had been disbanded due to cancellation of Russian Visiting Crew. In May 2006 Roscosmos, RGNII CTC and RSC Energia by their joint decision appointed him preliminarily TSV Flight Engineer to ISS-19 backup crew together with Salizhan Sharipov. Afterwards, however, he was transferred as Flight Engineer to ISS-17 backup crew. During June 2-10, 2006 he took part in the trainings (Sevastopol, Ukraine) in emergency water landing of descent module as a member of conventional crew together with Yuri Lonchakov and Oleg Artemyev. 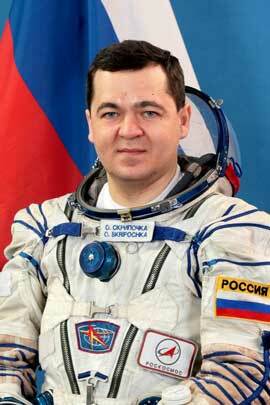 On November 6, 2007 at the meeting of Roscosmos Interdepartmental Commission for Selecting Cosmonauts and their Enlistment in Crews of Manned Space Vehicles and stations he was approved as backup Flight Engineer of ISS-17 and Soyuz-ÒÌÀ-12 transport manned space vehicle scheduled to be launched on April 8, 2008. In August 2007 he was preliminarily appointed to the backup crew of Expedition 20 (ISS-20À) to the ISS. According to these schedules, the prime crew is to be launched onboard Soyuz ÒÌÀ-16 space vehicle in September 2009.